Slagheap Cycles will be closed for the 2019 season. I'll be spending most of the year in California learning some new skills. After that, it is unlikely that we'll re-open for general service and maintenance, but will most likely go in a new direction with the shop. I'm sorry that we won't be able to help you with your bikes this year, and am grateful to all of you for your loyal use of our shop. Thank you for a good six years. 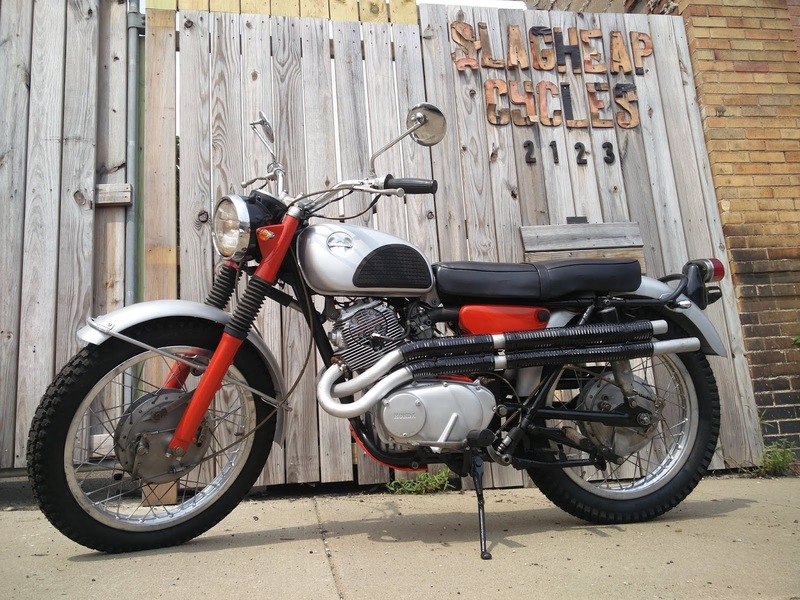 Here we have a 1967 Honda CL77 305 Scrambler, the high performance and rarest version of the venerable Honda Dream. 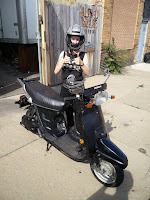 This version is twin carb and kickstart only, but it is still a 12 volt electric system, so you get decent lighting and better battery choices. We've completely rebuilt the motor, and everything on the bike has been disassembled, refurbished or replaced, and reassembled. 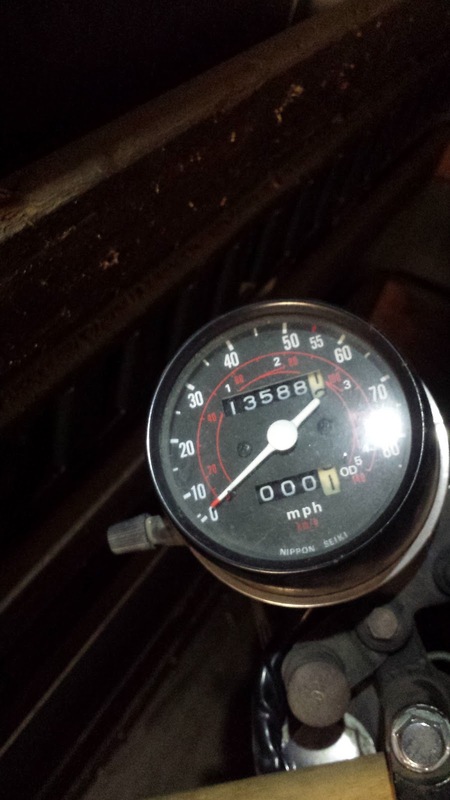 The bike came in with 13333 original miles and has *7* miles on a freshly rebuilt motor. 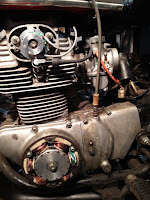 * top end bored .50 oversize w/new pistons, rings, etc. Bike is not in showroom condition, but looks very good and was built to be ridden. Rides great, sounds great, and starts first kick. 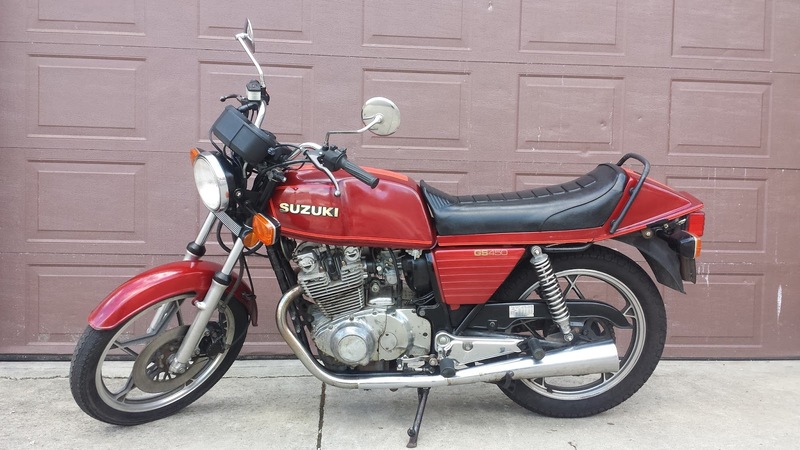 Also has a clean Pennsylvania title, a real rarity for bikes this old! Please get in touch if interested, thanks! Friends, the shop is going to be closed for a few weeks while Geoffrey tries to discover his sea legs sailing in Croatia. We will re-open on SEPTEMBER 6TH. We will not be checking our voicemail, and only sporadically checking email while the shop is closed, sorry about that. But we will be back at full swing in September. In the meantime, here's a few of the fun projects we've worked on this summer. I know, I know, you're thinking a GS450...I've seen a million of them, one of the most ubiquitous of the UJMs of the 80s. 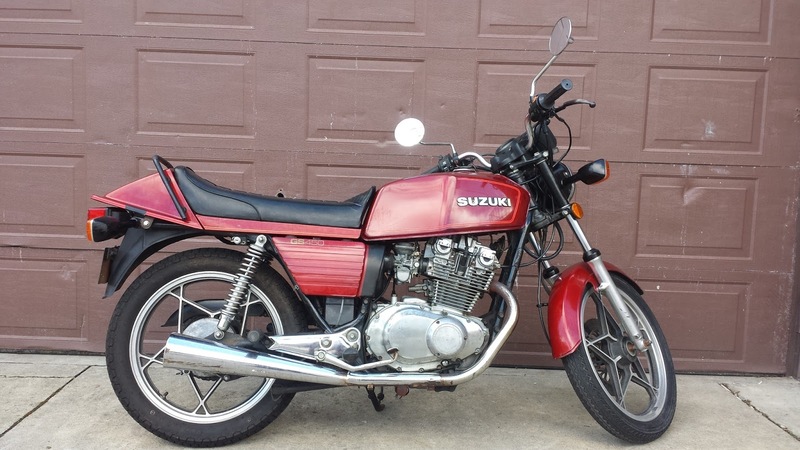 But have you seen *this* GS450. The EX variant is pretty dang cool (in this writer's humble opinion) - nice rear seat cowl, and a tank design that is basically a throwback the the earlier cafe racer style...*knee protectors not included. 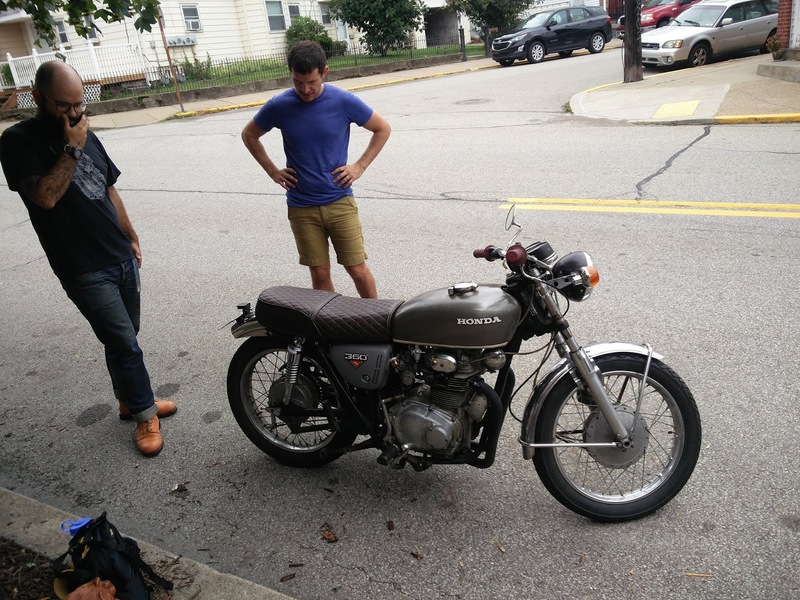 We did a lot of work to this bike after it languished in a basement. Valves have been adjusted with new shims, carburetors cleaned, and a year-old battery that has been kept well-tended. The only thing it really needs is a new front tire (tread is low). Buy it for what we're asking and we'll install the tire for free - just get a tire to us! If you've ever had issues with your CB450/500 stock Keihin carburetors, you might want to consider this conversion. 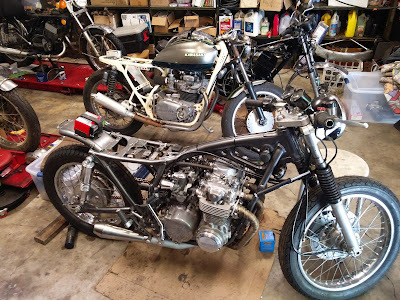 We've found the Keihin carbs from these bikes to be amongst the most difficult to get tuned correctly, especially on the CB500T with its additional circuits for the air cutoff valve, for which the rubber parts are extremely difficult to find. 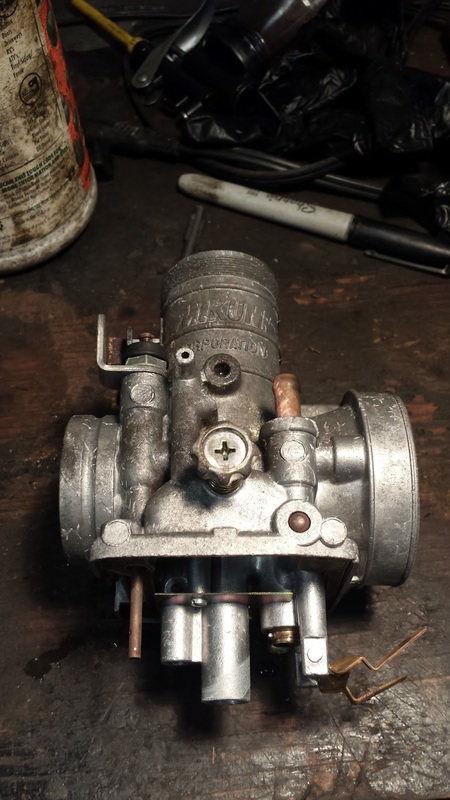 You have probably heard of the Mikuni VM32 carburetor - it's a classic model used on a wide variety of small engines, and really popular for racing. It's extremely tuneable with a huge variety of adjustable needles, jets, etc, all of which are widely available. Mikuni made many different variations on this carburetor for different applications. You may not have noticed, but there is something special about the ones we used. 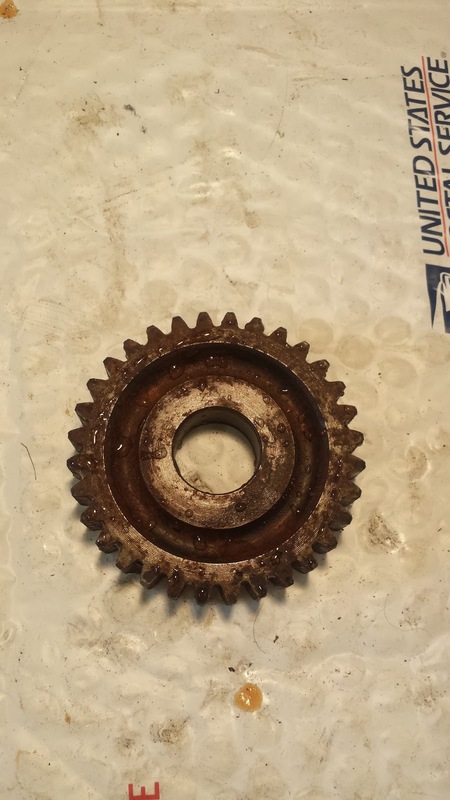 These were originally meant for 2-stroke snowmobiles and have small oil injection ports near the intake flange of each carburetor. We were able to convert these to be vacuum lines that can be used to synchronize the carburetors, which is very useful on any bike that doesn't have separate vacuum ports on the motor or intake manifold itself (think CB350, although you probably want to use a VM30 for the smaller motor). 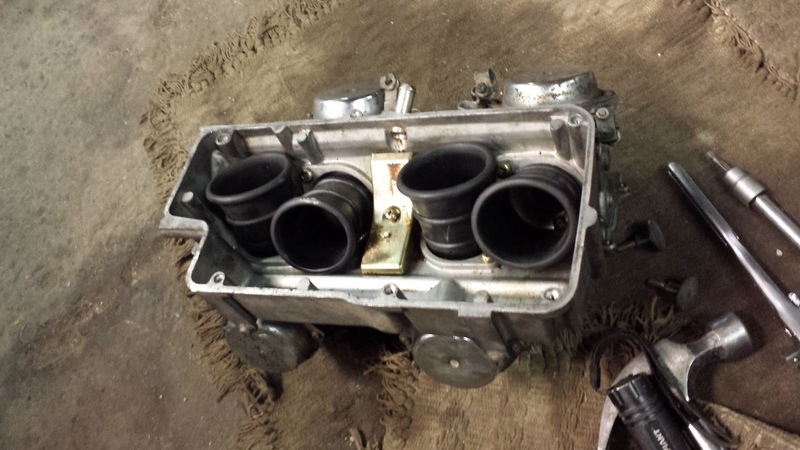 The carburetor intake boots do need to be replaced to accomodate the Mikuni, but we were able to create a setup for the air boots that allowed us to use the original airbox. 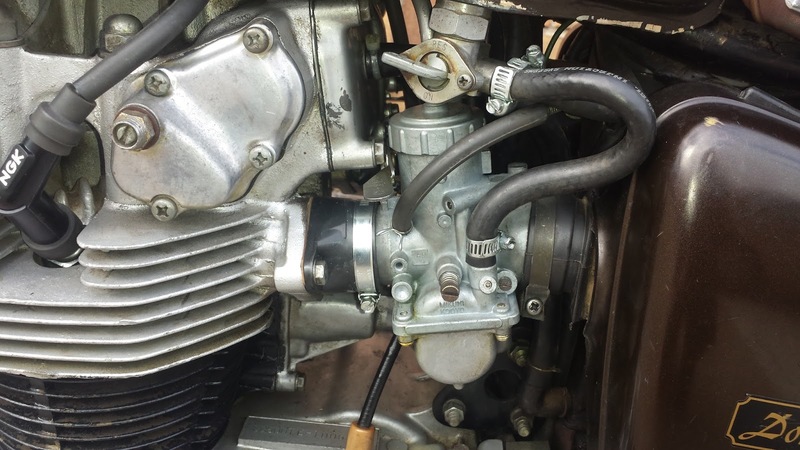 You will definitely want to experiment with the jet and needle sizes to get the correct fuel mixture at all throttle positions for your bike. The only other real issue is that the choke levers, idle and mixture adjustment screws are usually "left-sided," so the right carburetor will be difficult to adjust. 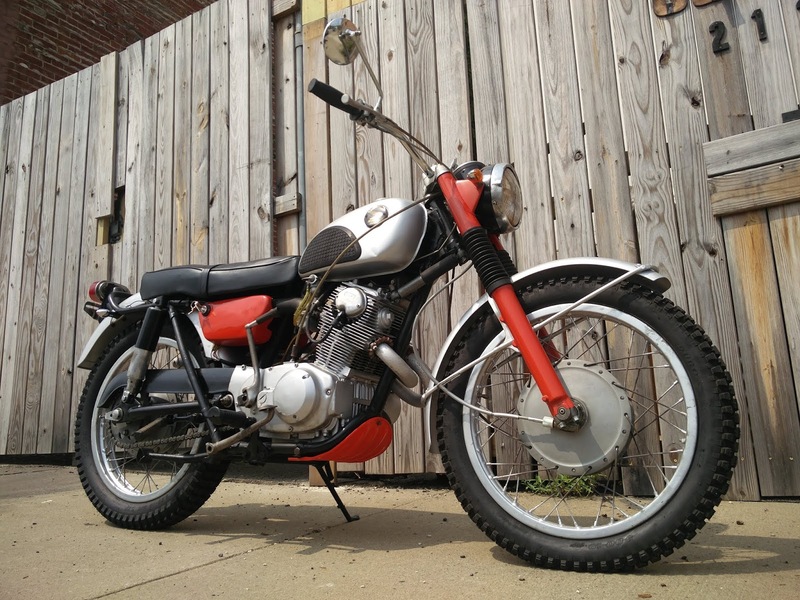 Right-sided carburetors exist, but are hard to find. However, there are different choke setups that can be installed, so once the initial carburetor setup is done, you can use the choke without much issue. Also, we can do all this work for you if you're interested, just get in touch! We finally got a sign after 5 years in business, courtesy of Britt Lawson, who freehand drew the letters and then cut 3/16" plywood out with a scrollsaw. So now you can find us easier when cruising down Forbes Avenue. Thanks Britt! 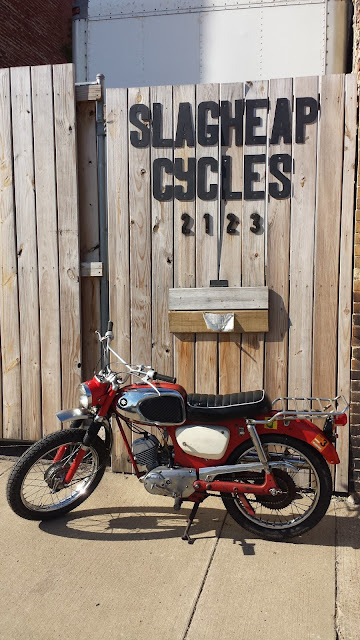 In front of our new sign is our newest bike, a 1967 Suzuki K15P, also known as the "Hillbilly" - a street/trail that was their rival to the hugely popular Honda CT90. The big difference is that this one is 80cc and a two-stroke, and has two different sprockets in the back, the idea being that you could have one chain on the small sprocket for street riding, and then swap it out for a longer chain on the rear sprocket for trail riding. It's a super fun little ripper, with supposedly a top speed of 55. 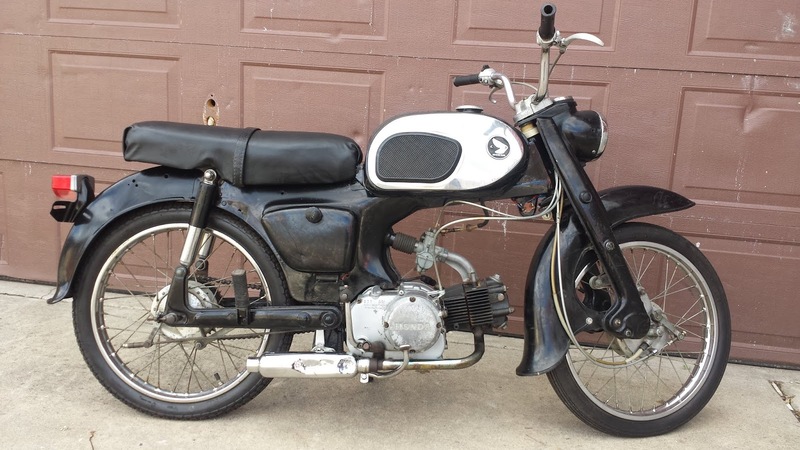 And of course, it's for sale. So get in touch if it strikes your fancy. Honestly, Ebay are a pretty awful company - but they're the only game in town when it comes to selling used parts online, and they know it. So, it looks like they'll be taking at least a 10% cut of anything we sell on their site...then Paypal gets their cut, but at least we can feel good that we're helping to keep the Post Office in business. The good news is that starting our ebay store has also forced us to organize the chaos that was our inventory of used parts. Now we actually kinda know what we have in all these boxes! So, if you see something you like, get in touch through phone or email for better prices! Cut out the middleman!